The heart of the Dallas-Fort Worth Metroplex, sunny Dallas offers its more than one million residents plenty of opportunities for outdoor activities, making swimming pools and hot tubs popular home additions. As the leading provider for Dallas fiberglass pool repair and resurfacing Dallas Fiberglass Pools keeps pools and spas in the city clean, safe, and sparkling. We also offer an array of services designed to enhance your enjoyment, from deck resurfacing and pool maintenance to crack repairs and pool plumbing installations. Texas Fiberglass Pools Inc. is your one-stop destination for everything that you need to transform your garden into a private oasis for fun and relaxation. At Texas Fiberglass Pools Inc. our team of experienced contractors performs pool maintenance and pool repair for homes and commercial establishments throughout the Dallas area. Fiberglass Pools Remodeling LLC is the premier source in Dallas for fiberglass baptistery resurfacing and repairs as well. Whether renovating decks, tiles and copings on a public pool, or resurfacing a custom pool in an exclusive Dallas neighborhood, we pride ourselves at providing timely, dependable, and professional results. Texas Fiberglass Pools Inc. makes it easy to take advantage of the multiple benefits of resurfacing your swimming pool in Dallas. Your pool will last longer and look better, and you’ll save thousands of dollars on replacement and repair expenses as well. Wherever you live in Dallas, call Texas Fiberglass Pools Inc. today to schedule a personal consultation to assess your pool, spa, or deck resurfacing needs. We offer a free written estimate and a guarantee that ensures the results will meet and exceed your expectations. At Texas Fiberglass Pools Inc. our team of experienced contractors performs pool maintenance and pool repair for homes and commercial establishments throughout the Dallas area. 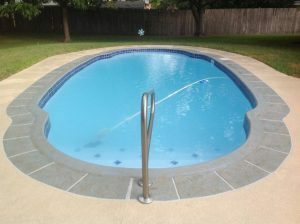 Texas Fiberglass Pools Inc. is the premier source in Dallas for fiberglass baptistery resurfacing and repairs as well. Whether renovating decks, tiles and copings on a public pool, or resurfacing a custom pool in an exclusive Dallas neighborhood, we pride ourselves at providing timely, dependable, and professional results. Our fiberglass resurfacing services are recommended for units constructed of ground gunite, concrete, or block and fiberglass walled with concrete bottoms. People commonly use a vinyl, concrete and paint, or concrete and plaster renovation; but these materials are cheap, require more maintenance, and wear out faster than fiberglass. Fiberglass coated pools are able to handle all the angles; steps, curves, and other features within a pool or hot tub are easily coated by fiberglass. Compared to other resurfacing materials, the fiberglass pool resurfacing that we offer through Texas Fiberglass Pools Inc. will hold up for more years of use and require less maintenance. There are different materials people use to line modern day pools, but we can assure you that fiberglass is the most durable, affordable, and easiest to install and maintain. Fiberglass pools maintain their shape in any condition, and they require much less maintenance that last decades without ever needing a full resurfacing. We offer a variety of colors for your fiberglass surface: white, light blue, blue, medium blue, and blue-green. Our fiberglass surfaces will bring sparkle and splendor to your homestead or commercial business for generations.